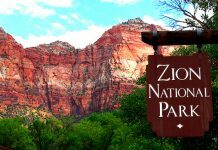 SPRINGDALE, Utah, March 21, 2019 (Gephardt Daily) — Zion National Park officials have closed the Narrows after heavy rainfall, which is expected to continue into Friday. The park also tweeted that the Kolob Canyons Road is closed to RVs and buses due to road damage. The road is open to passenger vehicles. The following trails are also closed: Observation Point (from Weeping Rock), Hidden Canyon, Upper Emerald Pools and Kayenta. A slow moving storm will bring precipitation to mainly the southern half of Utah through Friday morning, according to the National Weather Service of Salt Lake City.